I have read very few collections of short fiction in my life. There isn’t any particular reason why, I just seemed to have jumped from board books as a child straight to novels. It was the cover art and description of this book that drew me in, I had to read it. This collection features one novella and three short stories, I enjoyed them all. The title comes from a poem “Thirteen Ways Of Looking At A Blackbird”, a nod to how much of life is about perception. 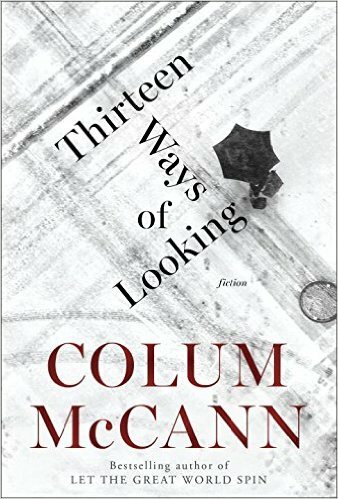 The first story “Thirteen Ways Of Looking” is about an elderly man standing in the twilight of his life. It flips back and forth between the immediate past and the present (after his death) told from his view and that of a commentator type narrator. I didn’t want to like Mr. Mendelssohn at first, he seemed a combination of stereotypes but he grew on me. I was born in the middle of my very first argument. In brief snippets of his past and his musings on the present we get a clear portrait of man who has lived a good life, a life he is reflecting on. And how is it that the deep past is littered with the characters, while the present is so housebroken and flat? The second story “What Time Is It Now, Where You Are?” was my least favorite but still offered a few moments of clarity. A journalist is writing a story on a deadline and he struggles to connect the pieces. Out beyond the outpost, nothing but the dark and the white frost on the land. The stars themselves like bulletholes above her. The third “Sh’kol” really resonated with me, if only because of the title. She had come upon the word sh’khol. She cast around for a word to translate it but there was no proper match. There were words, of course, for widow, widower, and orphan, but no noun, no adjective, for a parent who had lost a child. A woman on the Irish coast is raising an adopted special needs child alone. She wakes up one morning and he is missing. Will he be found? Will she glean anything about her life in the process? Sh’khol…She knew the word now. Shadowed. The final story “Treaty” was truly touching. An elderly Maryknoll nun sent for respite in Long Island. A traumatic event in her life haunts her and the potential emergence of a villain spurs her to action. I truly enjoyed reading these stories. I found myself stopping to highlight and ponder often, bits and pieces of my own life coming to mind. McCann is a gifted wordsmith, his framing of the concept of perspective a thing of beauty. I have several people in mind already that I will personally recommend this collection to.